Model a simple gift for someone special for Christmas. Use threading techniques to stitch around the edge for a beautiful handmade look. Take a small portion of Potato Clay and model the shape you desire. 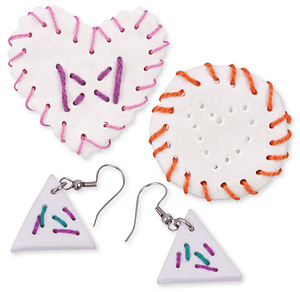 Use Perle Cotton to sew a pattern in and around your shape. Create a pattern by poking a needle into the clay. Attach Shepherd Hooks to create earrings.